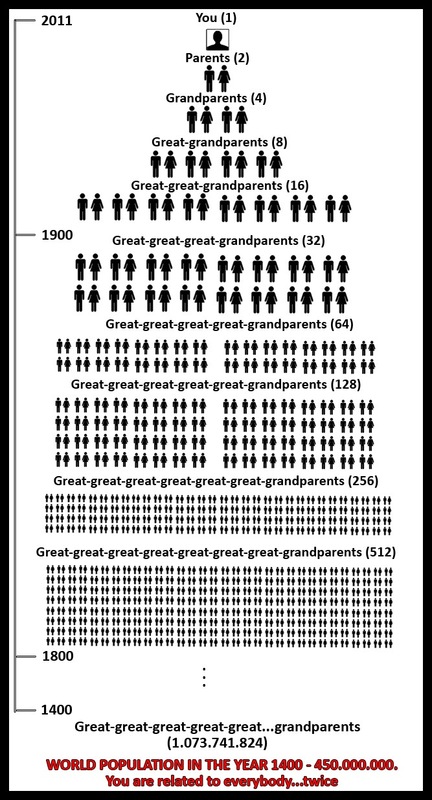 We all have two parents, four grandparents, eight great grandparents, sixteen 2nd great grandparents, thirty-two 3rd great grandparents, sixty-four 4th great grandparents, etc. perfectly illustrated by this graphic. What follows are the derivations of some of the surnames found in our combined family trees as far back as 2nd Great Grandparents (period covered circa 1820-1860). Patronymic surname meaning ‘son of Adkin’, Adkin being a pet-form of Adam. John Adkynsone appears in the Staffordshire Subsidy Rolls in 1381. Cottle notes that it is “overwhelmingly northern.” This is borne out by the distribution map of 1891 which shows it predominantly in the contiguous counties of Cumberland, Lancashire, Yorkshire and Durham. A relatively rare surname, not found in concentrations above 650 in any county. Lancs, Cumberland, Yorks predominantly. The first instance noted by Reaney & Wilson was Walter de Bakhous in 1306. Apart from Essex, more common north of The Wash.
Peter de Baggeleg’ appears in the 1260 Assize Rolls in Cheshire. From Bennington, a place-name in Hertfordshire & Lincolnshire. Almar de Benintone is listed in Domesday Book in Hertfordshire. In his chapter on The Homes of Family Names Reaney (1991) notes it as a Lincolnshire surname. If this is the case then the original bearer of the surname was linked to (Long) Bennington, ‘the tun of Beonna’s people’ [Beningtun, Domesday Book]. Found most often in Yorkshire in 1891. Numerous throughout England and Wales but found in greatest numbers in Yorkshire. Hugh Chapman is the first known bearer of the surname in the 1206 Curia Regis Rolls in Yorkshire. Found in greatest numbers in the contiguous counties of Yorkshire, Lancashire and Cumberland. Robert (le) Cupere 1176-7 Pipe Rolls, Surrey. Richard del Crosse appears in the Assize Rolls for Lancashire in 1285. Egelina de Curtenay appears in the Curia Regis Rolls for Oxfordshire in 1207. Egelina is probably a Norman form of Old German Agilina. Relatively uncommon and found mostly in Lancashire and Yorkshire. Ekwall shows it as: Etchells, Northenden & Stockport, Cheshire. Echelis 1248. It is a Cumberland-Lancashire-Cheshire surname in 1891. Richard de Echeles 1269 Assize Rolls, Staffordshire. “The seal of Walter Forestier (1371, A Descriptive Catalogue of Ancient Deeds, London) bore the legend: SIGILLVM. WALTERI. LE. FOSTER from Forseter ‘shearer’, which would inevitably become Forster and then Foster. “English: 1. Diminutive of Gibb.” A surname which came about as a result of one of the new personal names introduced after the Norman conquest. I have been unable to find any references to the surname Gilthorpe in any of the usual surname dictionaries. The second element is Old English þorp hamlet or outlying dairy-farm, indicating a place-name. The first element must be a personal name, maybe Gill or Giles (cf. Gillson, Gilson). The surname changes over time and around the 18th century has variants Gelsthorpe and Gilsthorpe (and also Gelsthrup, Guelstrop, etc) perhaps more accurately reflecting the ‘s’ of Giles? In addition, Ekwall shows the derivation of Gilsland in Cumberland as ‘Gille’s land.’ “Probably named from Gille son of Bueth who is mentioned in the Lanercost foundation charter (1169).” His interpretation is one of ‘servant’ rather than personal name. No more than 3 instances in any county in 1891. Found only in Notts-Derbys-Yorks-Westmorland. Very rare (no more than 40 instances), with concentrations in the West Midlands and in Yorkshire in 1891, reflecting both its origin and the region where the Godridge brothers migrated to in the mid-19th century. There are more instances of the surname in Lancashire and Cumberland than elsewhere in England and Wales. Over thirty places according to Cottle, “almost all in Yorkshire”, which may explain why Reaney (1991) notes it as a Yorkshire surname: (Sand) Hutton. Distribution maps in 1891 show it to be a Lancashire-Yorkshire-Durham surname. Ernewi de Hottona 1175 Pipe Rolls for Yorkshire. Adam Jackesonne 1327 Subsidy Rolls for Suffolk. 24th commonest surname in England and Wales in 1853. Despite this, it is predominantly northern: Cumberland, Lancashire, Yorkshire, Durham and Cheshire. Widespread and numerous but most concentrated in Yorkshire. Janyn le Breton 1332 Subsidy Rolls for Lancashire. Second commonest name in England and Wales (after Smith). Despite this, more predominant in northern England and the West Midlands than elsewhere in England. ‘Son of Mann.’ Magnusson. Common in Shetland. John Mannisson 1305 Suffolk Feet of Fines. A Lancs-Yorks-Durham surname at the time of the 1891 census. A northern and Midlands surname; found less often south of The Wash.
John Macun c.1130 in London, Ancient Charters. Interchangeable with Manson in our family. Predominantly an Essex/Suffolk surname. Richard en le Okes 1383 Staffordshire. Not present in huge numbers anywhere but oddly predominant in Lancashire and Cumberland. From Priddy in Somerset. Pridi c.1180. A derivative of Welsh pridd ‘earth, soil’. The place is on [the] Mendip Hills. The version with an ‘e’ is rare (no more than 60 instances per county) and found mostly in the West Midlands. The first recorded instance of a variant of the surname is for William Pridy who appears in the Subsidy Rolls for Worcestershire in 1327. Ekwall notes that the Northumberland place was Roff’ in 1208 Curia Regis Rolls, Rucestr by 1242. Thus the first element may be Old English hroc ‘rook’. Surname distribution maps prove that, in fact, it is the northern place-name which is the main source of the modern surname. There were fewer than 36 instances of the surname in south coast counties whereas there were between 109-215 in Durham and Northumberland in 1891. Turoldus (de) Roucestra 1086 Domesday Book in Essex. “1. English, French, and German; from the name of the flower, Middle English, Old French rose, German Rose, Middle High German rose (Latin rosa), in various applications. In part it is a topographic name for someone who lived at a place where wild roses grew. In a town, it can also be a house name from a house bearing the sign of the rose. For many years I thought that Seary might be a variant of Irish Seerey but it never crops up in this form. I have now traced the surname as far back as 17th century Oxfordshire without a hint of Irish ancestry cropping up. No more than 75 instances anywhere, the surname is fairly evenly distributed across England and Wales, with slightly higher concentrations in Lancs/Yorks, the Home Counties and Kent. Oddly disparate. A name which Virginia Woolf uses for a character in Orlando, Shelmerdine doesn’t appear in any surname dictionaries. In fact, it is a place-name in Lancashire. Bickerstaff-with-Shelmerdine was a township in the parish of Ormskirk according to Joseph Aston’s Lancashire Gazeteer of 1808. Despite its spelling the name is pronounced ‘shelmerdean’ with the emphasis on the last syllable. Comparatively rare – no more than 474 instances in any county – it is found particularly in Lancashire and Cumberland. Cottle notes it and its variants as Yorkshire-Derbyshire surnames. In 1891 it is most concentrated in Yorkshire-Lancashire. Thomas Sydall 1379 Yorkshire Poll Tax Returns. “Occupational name or habitation name for someone who was employed at or lived near one of the houses (‘temples’) maintained by the Knights Templar, a crusading order so named because they claimed to occupy in Jerusalem the site of the old temple. The order was founded in 1118 and flourished for 200 years, but was suppressed as heretical in 1312”. A comparatively rare surname – mostly northern – and found particularly in Yorkshire-Durham-Northumberland, reflecting the distribution of the ancient sites of the Knights Templars’ houses in England. Warbrick is synonymous with Warbreck, the place in Lancashire. Wardebrecca 1147. ‘Beacon hill.’ From Old Norse varði cairn + Old Norse brekka slope, hill. Robert de Warthebrek 1332 Subsidy Rolls, Lancashire. Scarcely found outside the north-west of England and no more than 260 instances of the surname anywhere, the majority of which occur in Lancashire and Cumberland. An unknown surname before the 19th century. All present-day bearers of the surname are descended from one man, Joseph Whipday, who was born around 1800 and died before civil registration began in 1837. He was a Navigator (i.e. a canal builder or navvy). He had four sons whose names appear in the records variously as Whitby, Whipdale, etc. Whipday must therefore be a corruption of some other surname. At the time of the 1891 census there were 9 Whipday families in Lancashire, all of whom can be traced back to Joseph Whipday. A surname distribution map shows that, although it is distributed across England and Wales, it is most commonly found in Lancashire and Yorkshire. Patere le Writh 1214 Feet of Fines, Sussex. Cottle, B. 1978. The Penguin Dictionary of Surnames, 2nd ed., Reading: Penguin Books Ltd.